Suzuki is offering a Factory Bonus to Australian farmers, with $500\* available on all models above 400cc from Suzuki's hard-working, value-packed KingQuad farm ATV range. Suzuki Motorcycles, the first manufacturer to produce four-wheel ATVs, has taken the wraps off the 2011 KingQuad 750AXi 4x4, the flagship model of its proven ATV range. The first manufacturer to produce four-wheeled ATVs, Suzuki is proud to introduce its latest KingQuad farm ATVs to Australia, including the new KingQuad 750 4 X 4 Power Steering. 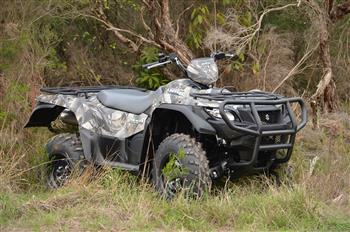 Suzuki Motorcycles has taken the wraps off the all-new KingQuad 750, headlining its new KingQuad farm ATV range. 2016 Suzuki KingQuad 750AXi 4x4 Power Steering Camo Edition. "Shown with optional Genuine Accessory front and rear bars"